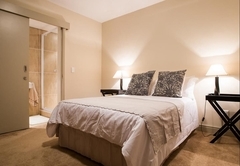 Loddey's Self Catering Apartment Four is a property providing self catering in Strand for up to 6 guests visiting the Cape Helderberg region. 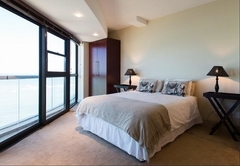 Boasting a sea facing position, Loddeys Self Catering Apartment Four is a stylish and modern six sleeper apartment. 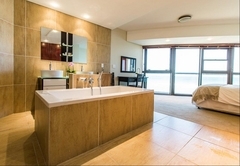 The apartment complex boasts a prime position on Strand’s Beach Road. 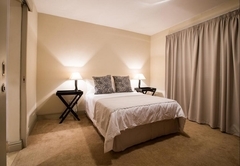 Here you are close to restaurants and other amenities that are within walking distance. The spacious apartment has three bedrooms. 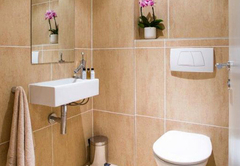 Each room has its own en-suite bathroom and there is also a separate guest toilet. 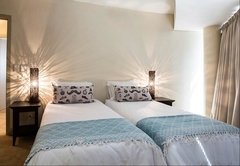 Rooms are furnished with either two single beds or a double bed. The unit has an open plan kitchen and living area. The kitchen is fully equipped for self catering and includes a dishwasher, washing machine and tumble dryer. 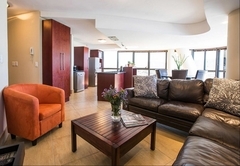 The living area is furnished with a six seater dining table and has a TV with selected DStv channels. 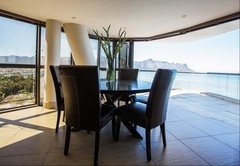 This area opens onto a balcony with views over False Bay. 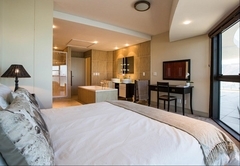 The Ocean View complex has a swimming pool and braai facilities that guests can make use of. There is excellent security and basement parking. 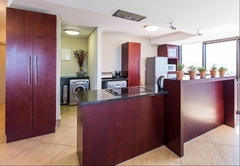 Response timeLoddey's Self Catering Apartment Four typically responds to requests in 5-10 minutes.